World Map illustrates location of top ten Mine Disasters around the World as measured by Casualties. The major disaster are Honkeiko Colliery mine in Benxi, China On April 26, 1942, a gas and coal-dust explosion in the mine killed 1549 and Courrières mine disaster, the worst mining accident in European history, killed 1099 miners in Northern France. The world has seen many mine disasters caused in the coal and hard rock mining processes. Every year, thousands of miners lose their lives in the mining accidents. Most of the deaths that occur in these accidents are reported from developing countries, especially China. Mining disasters occur due to leak of poisonous gases such as hydrogen sulfide, dust explosions, flooding, and most of the time due to malfunctioning of mining equipments. 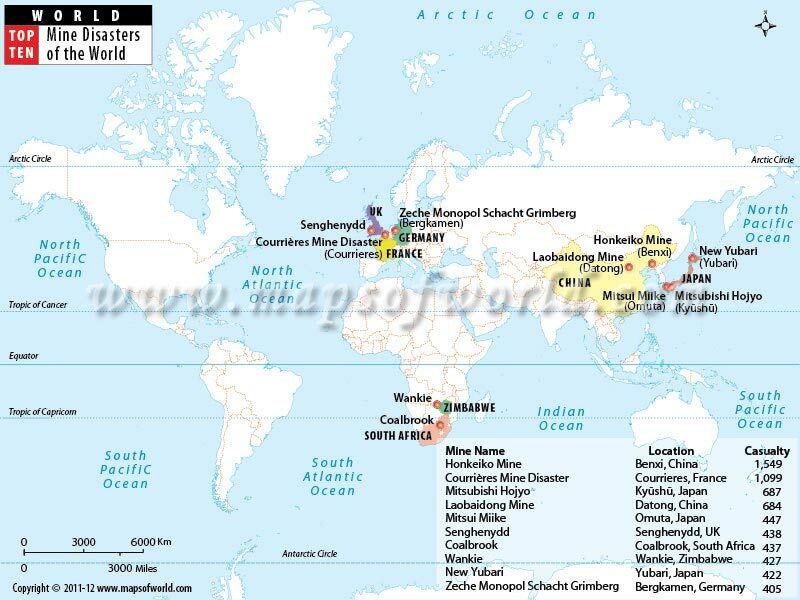 The world map with top ten mine disasters of the world shows the location of top ten mine disasters that rocked different parts of the world. As the map shows, the worst mine disaster occured in Benxi, China on April 26, 1942, when a coal-dust explosion in the mine killed 1,549, 34% of the miners; it is the worst mining disaster till date. Another major disaster took place in Courrieres, France on March 10, 1906. It is known as the Courrieres mine disaster and is considered the worst mining accident in European history. Over 1099 miners lost their lives in Northern France in the accident. The other major mine disasters and the number of casualties that occurred are also shown in the map.